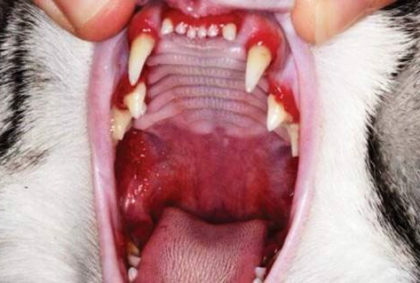 Feline Stomatitis Gingivitis is a chronic, oral immunological disease that effects the soft tissues of the gums and tongue, causing them to become inflamed. The precise, underlying reason for this disease is unknown, making it difficult to treat since we are uncertain of the cause. However, it appears to be caused by a hypersensitivity to plaque, due to the cat’s immune system over-reacting to plaque and tartar. Symptoms are painful oral inflammation and ulcers; quite possibly throughout the pet’s entire mouth. Bad breath, bleeding gums, extensive plaque on the cat’s teeth, excessive drooling or salivation, difficulty eating, buildup of fluid in the gums and early loss of teeth. Left untreated, bacteria or infection can enter the cat’s bloodstream causing more severe issues. It is estimated that 2% of the feline population is affected by Feline Stomatitis Gingivitis. Antibiotics and steroids are usually prescribed to control the pain; however, those medications will not correct what is causing the immune system’s reaction with plaque production. Furthermore, once the inflammation clears up and the medications are stopped, the condition returns. To make matters worse, these conventional methods of treatment become less and less effective as they are used repeatedly on the pet. More often than not, the cat’s condition is not noticed until the pet can barely eat its food. The only solution at this stage is to completely remove the plaque and diseased parts of the teeth to prevent any further recurrence. The worst case scenario is a full mouth extraction of the teeth. Stem cells “reset” the cat’s immune system. By injecting stem cells – even without pulling the cat’s teeth – the plaque will no longer adversely affect the soft tissue inside the cat’s mouth. The teeth will clear up and plaque or tartar can then be handled during normal cleanings. Your pet can be treated with one or two stem cell injections intravenously and be resolved of the issue for life.